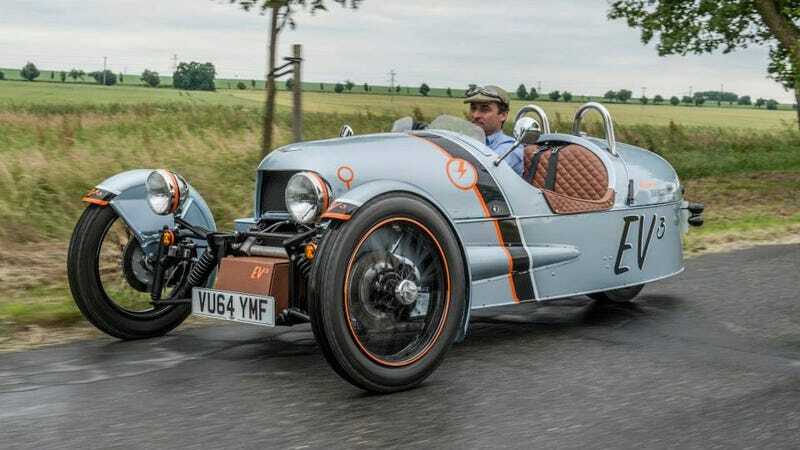 We’ll see an almost production-ready version of Morgan’s electric 3 Wheeler at the Geneva Motor Show, with the huge difference being that its motor is at the rear. Morgan’s first production EV goes on sale in the summer. Morgan made its first electric concept back in 2011, but the Plus E was never supposed to be more than something we could think about between two coffees at the Geneva Motor Show. Despite having a manual transmission, it was just too heavy to deserve the Morgan badge. Four years later, EV technology has reached such an advanced stage that Morgan decided to revisit the idea (after getting some government money) in its quest to double sales figures through reaching new markets and a younger audience. Funny enough, at approximately 1,036 pounds, the electric 3 Wheeler is promised to be significantly lighter than the loud version. According to Autocar, Potenza’s electric motor produces 75 horsepower and 96 pound feet, giving the 3 Wheeler a 100mph top speed with the 0-60 mph sprint taking 8.5sec. The range provided by its lithium-ion battery packs is up to 150 miles, with a full recharge taking four hours. Morgan says the final figures are all set to be improved before it hits the streets. This is just a prototype, the final product will not be ready by Geneva. He also said that “the weight distribution is similar so it’s very familiar to handle, and you can disturb the rear wheel in a corner.” We expect no less. Morgan will listen to the customer feedback and modify the EV accordingly before starting production this summer at about one unit per week.